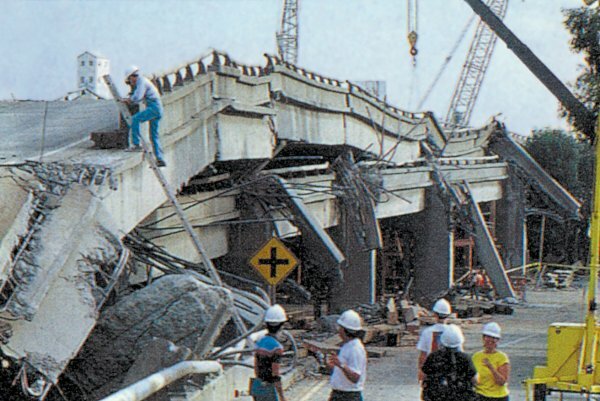 As we’ve seen from the example of the 1985 Mexico earthquake, the geological foundations on which structures are built can have a significant impact on earthquake shaking. When an earthquake happens, the seismic waves produced have a wide range of frequencies. The energy of the higher frequency waves tends to be absorbed by solid rock, while the lower frequency waves (with periods slower than one second) pass through the solid rock without being absorbed, but are eventually absorbed and amplified by soft sediments. It is therefore very common to see much worse earthquake damage in areas underlain by soft sediments than in areas of solid rock. A good example of this is in the Oakland area near San Francisco, where parts of a two-layer highway built on soft sediments collapsed during the 1989 Loma Prieta earthquake (Figure 11.17). Building damage is also greatest in areas of soft sediments, and multi-storey buildings tend to be more seriously damaged than smaller ones. Buildings can be designed to withstand most earthquakes, and this practice is increasingly applied in earthquake-prone regions. Turkey is one such region, and even though Turkey had a relatively strong building code in the 1990s, adherence to the code was poor, as builders did whatever they could to save costs, including using inappropriate materials in concrete and reducing the amount of steel reinforcing. The result was that there were over 17,000 deaths in the 1999 M7.6 Izmit earthquake (Figure 11.18). After two devastating earthquakes that year, Turkish authorities strengthened the building code further, but the new code has been applied only in a few regions, and enforcement of the code is still weak, as revealed by the amount of damage from a M7.1 earthquake in eastern Turkey in 2011. Fires are commonly associated with earthquakes because fuel pipelines rupture and electrical lines are damaged when the ground shakes (Figure 11.19). Most of the damage in the great 1906 San Francisco earthquake was caused by massive fires in the downtown area of the city (Figure 11.20). Some 25,000 buildings were destroyed by those fires, which were fuelled by broken gas pipes. Fighting the fires was difficult because water mains had also ruptured. The risk of fires can be reduced through P-wave early warning systems if utility operators can reduce pipeline pressure and close electrical circuits. Earthquakes are important triggers for failures on slopes that are already weak. 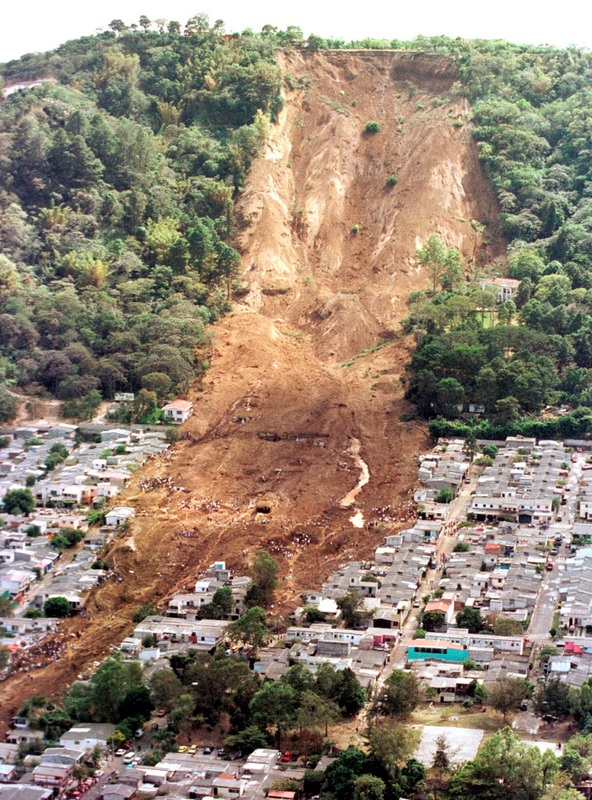 An example is the Las Colinas slide in the city of Santa Tecla, El Salvador, which was triggered by a M7.6 offshore earthquake in January 2001 (Figure 11.21). Ground shaking during an earthquake can be enough to weaken rock and unconsolidated materials to the point of failure, but in many cases the shaking also contributes to a process known as liquefaction, in which an otherwise solid body of sediment is transformed into a liquid mass that can flow. When water-saturated sediments are shaken, the grains become rearranged to the point where they are no longer supporting one another. Instead, the water between the grains is holding them apart and the material can flow. Liquefaction can lead to the collapse of buildings and other structures that might be otherwise undamaged. 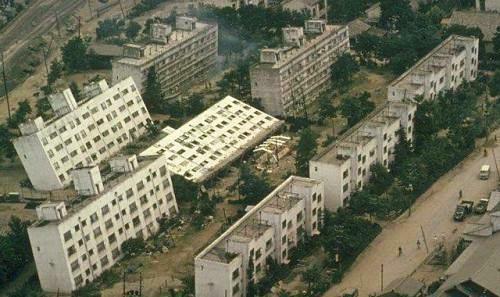 A good example is the collapse of apartment buildings during the 1964 Niigata earthquake (M7.6) in Japan (Figure 11.22). 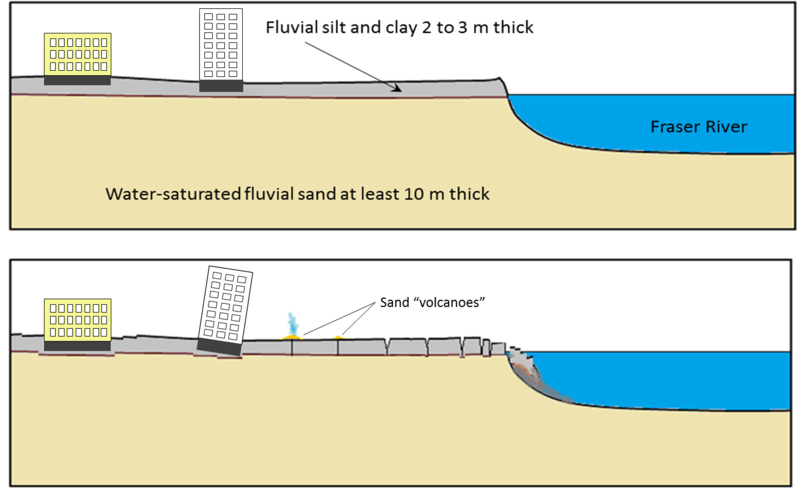 Liquefaction can also contribute to slope failures and to fountains of sandy mud (sand volcanoes) in areas where there is loose saturated sand beneath a layer of more cohesive clay. Parts of the Fraser River delta are prone to liquefaction-related damage because the region is characterized by a 2 m to 3 m thick layer of fluvial silt and clay over top of at least 10 m of water-saturated fluvial sand (Figure 11.23). Under these conditions, it can be expected that seismic shaking will be amplified and, the sandy sediments will liquefy. This could lead to subsidence and tilting of buildings, and to failure and sliding of the silt and clay layer. Current building-code regulations in the Fraser delta area require that measures be taken to strengthen the ground underneath multi-storey buildings prior to construction. Earthquakes that take place beneath the ocean have the potential to generate tsunami. 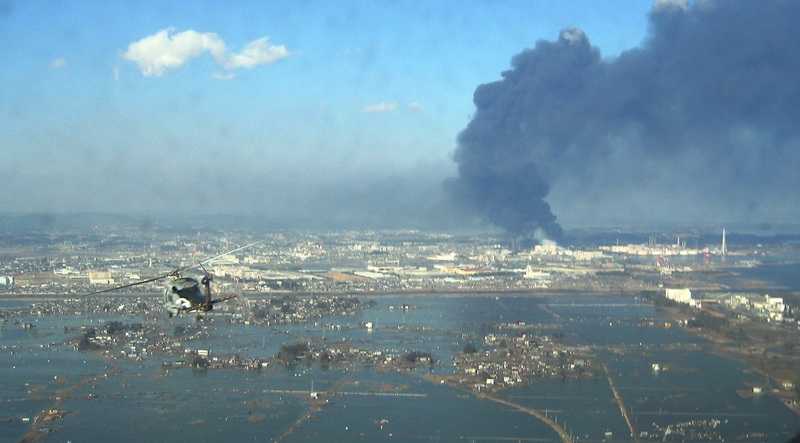 [footnote]Tsunami is the Japanese word for harbour wave. It is the same in both singular and plural. [/footnote] The most likely situation for a significant tsunami is a large (M7 or greater) subduction-related earthquake. 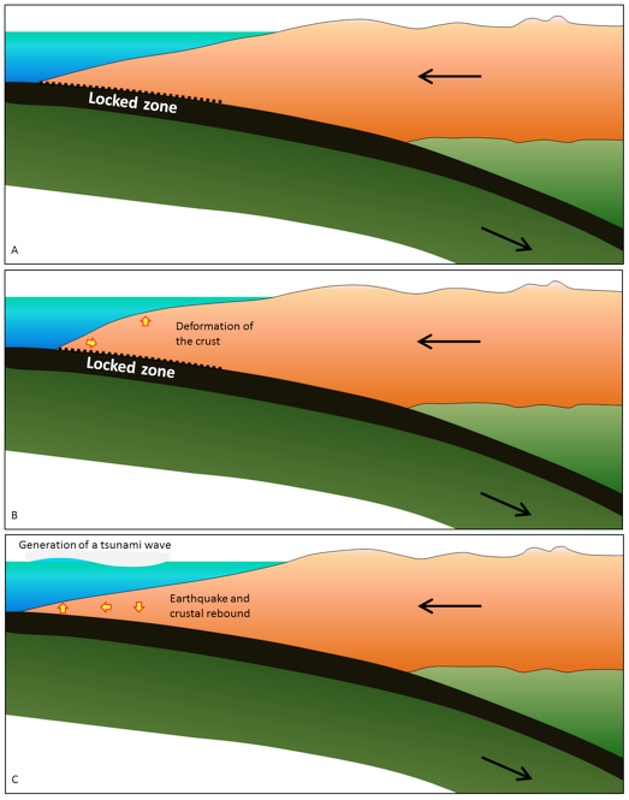 As shown in Figure 11.24, during the time between earthquakes the overriding plate becomes distorted by elastic deformation; it is squeezed laterally (Figure 11.24B) and pushed up. When an earthquake happens (Figure 11.24C), the plate rebounds and there is both uplift and subsidence on the sea floor, in some cases by as much as several metres vertically over an area of thousands of square kilometres. This vertical motion is transmitted through the water column where it generates a wave that then spreads across the ocean. Tsunami waves travel at velocities of several hundred kilometres per hour and easily make it to the far side of an ocean in about the same time as a passenger jet. 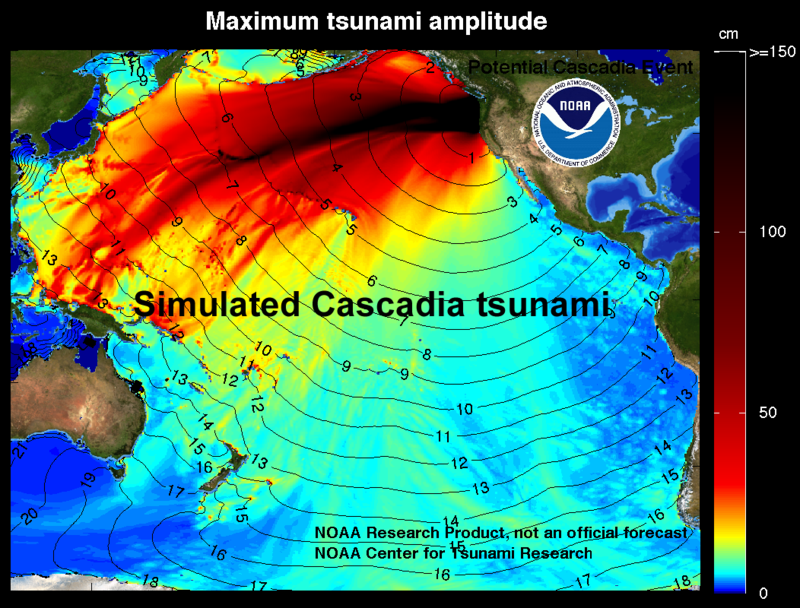 The simulated one shown in Figure 11.25 is similar to that created by the 1700 Cascadia earthquake off the coast of British Columbia, Washington, and Oregon, which was recorded in Japan nine hours later. 11.4 The Impacts of Earthquakes by Steven Earle is licensed under a Creative Commons Attribution 4.0 International License, except where otherwise noted.